A Cornell professor takes the leap from sundry to spiritual in his quest to discover the ancient Islamic pillar of faith. "You have to be willing to look at stuff about health of Hajjis, things about surveillance, the actual movement," Tagliacozzo says. "[The book] is not going to be pared down -- it's going to be a history of Hajj from the earliest times." Eric Tagliacozzo went from writing about weapons and drugs and incendiary newspapers smuggled in and out of Southeast Asian states to the Islamic pilgrimage called Hajj. The leap from sundry to spiritual was perhaps, to the lesser-trained eye, a big one, but Tagliacozzo explains it like this: Just four pages of his forthcoming 400-page book, Secret Trades, Porous Borders: Smuggling and States Along a Southeast Asian Frontier, 1865-1915, are about Dutch and British Colonial authorities in Southeast Asia who were worried that pilgrims were bringing illegal items from the Middle East. But those four pages were enough to ignite Tagliacozzo's interest in the centuries-old practice of Hajj. "There's been almost nothing written about Hajj from Southeast Asia," Tagliacozzo says, even though millions of people over the centuries have taken the trip. So Tagliacozzo took to the task of writing the history -- from the earliest times to the present -- for his next book which he says is, "about how history and anthropology might be combined in writing a history of the Hajj." Tagliacozzo took a one-year sabbatical in 2004 from his post as a professor of History and Asian Studies at Cornell University to travel Southeast Asia. He studied archives of Dutch, Malay and Indonesian written sources, memoirs and state records, colonial and post-colonial. He read information about shipping and government religious affairs departments for his expansive history. "You have to be willing to look at stuff about health of Hajjis, things about surveillance, the actual movement," Tagliacozzo says. "[The book] is not going to be pared down -- it's going to be a history of Hajj from the earliest times." When it came time to research recent history, Tagliacozzo picked up a rough sack and traveled all over Muslim Southeast Asia, interviewing about 80 people throughout the region about their pilgrimage experience. "I really spent four months in earnest just traveling from place to place trying to talk to people -- sitting in mosques and on docks and on buses and anywhere else," Tagliacozzo says. He traveled through southern Thailand, all over Malaysia, the Philippines, Singapore and parts of Indonesia conducting interviews mostly in Indonesian and Malay. He gathered stories from the elderly and the young, men and women, rich and poor who all went on Hajj from Southeast Asia. Working from a paradigm that followed current Southeast Asian studies "attempts to marry history and anthropology," Tagliacozzo says he was surprised by the broad spectrum of interviews he was able to conduct. "One of the great delights of doing this research was figuring out that women were willing to talk to me," he says. He was never alone with a Muslim woman, but half of the respondents were women. "One Filipino Muslim told me that he met a young Chinese Muslim who had hitchhiked for three months by himself to get to Pakistan to be able to go on Hajj." Tagliacozzo says he was interested in the way in which different people come together at Mecca; Hajj, it turns out, is one of the oldest types of cross-cultural mingling. In Malay culture, for example, one person told him they clean coins in tamarind water and put them in glutinous rice for future Hajjis and Hajjahs, a practice not found in other Muslims' Hajj regimens. "You can see in the Hajj the meeting of what is local and what is the translocal in a Muslim idiom," Tagliacozzo (pictured right) told a room of people at the UCLA "Islam and Hinduism in the Indian Ocean World" conference last month. As an example, Tagliacozzo said, "One Filipino Muslim told me that he met a young Chinese Muslim who had hitchhiked for three months by himself to get to Pakistan to be able to go on Hajj." He recounted the story of a man from Sumatra who went on Hajj at the age of twenty-one. The man, Tagliacozzo said, was fascinated to see Indians, especially Indian women who were wearing saris before they put on the correct garments for prayer. "He ogled these women as he landed in Jeddah and Saudi policemen came after him with a stave and told him they were going to throw him in prison if he didn't stop doing this." Tagliacozzo also said he talked to Malays who saw Africans for the first time on Hajj, who were fascinated be the groove scars in their cheeks and their multicolored clothing. In light of the Hajj's capacity to bring together so many disparate groups, Tagliacozzo then asked interviewees the question, "Is there racism and ethnocentricism in Mecca?" Almost all respondents said no, but as he continued to probe he found that there was some stereotyping. Most Southeast Asian women, for example, reported feeling "physically smaller" and "pushed around" by West Africans and Afghanis while circumambulating the Ka'bah, the cube-shaped structure in Mecca where Muslims turn to pray. Southeast Asian women Tagliacozzo spoke with "felt that Arabs treated their women very badly in Mecca." Tagliacozzo recounted an interview: "'We do better in Southeast Asia," she told me. "No man should ever be allowed to treat his wives and sisters in that way.'" These were, of course, Tagliacozzo's translations. His subjects spoke Indonesian and different Malay dialects, which begs the question, how do these diverse people communicate in Mecca? Tagliacozzo found that, for example, people from Thailand often had trouble in Saudi Arabia; many vendors and locals in Mecca learn a fair bit of Indonesian and common Malay, but not many speak Thai. A blind Chinese man from Malaysia experienced Mecca entirely through what he heard. He reported hearing an "altitude of languages," said Tagliacozzo, which was to say that there were "many different languages all functioning at once." "Each person is given a space of about three feet, basically just enough for one to sleep." A Malay woman in her sixties who went on Hajj twice -- once as ten-year-old and once ten years ago -- remembered being on ship in middle of Indian Ocean in 1951. Two elderly passengers died and their bodies were wrapped in canvas sail cloth and lowered into the ocean. "There literally must be a trail of skeletons" connecting Southeast Asia and East Africa to Mecca, said Tagliacozzo. Another pilgrim also remembered the journey by sea in the 1950s. Tagliacozzo translated from Malay: "In 1952 there was no air transportation. We traveled for fourteen days by ship." The journey was hectic and there was no segregation of passengers. "Each person is given a space of about three feet, basically just enough for one to sleep." 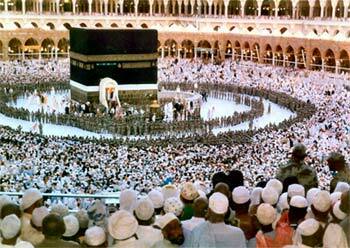 The Hajj itself takes fourteen days but the journey alone at that time could take between eighteen and twenty days. Even now, people take the trip under difficult circumstances. Southeast Asia has rich and poor countries and "the Hajj from Southeast Asia reflects these very diverse realities," said Tagliacozzo. Wealthy people from Singapore and Brunei stay in comfortable hotels like the Hilton Makkah near the main mosque. Cambodian Muslims, on the other hand, reported staying on the floor of a single room shared by forty-five people in a dormitory two miles away. Thai Muslims used to go on Hajj with Malays, Tagliacozzo said, but "apparently what is now happening is exactly the opposite." Lines have gotten so long and corruption so bad in the organization that organizes the Malay Hajj, that many people go illegally over the border to take the Thai Hajj instead. An 81-year-old woman left southern Thailand once in her life at the age of 79 to go on Hajj by herself. Tagliacozzo asked her if she was afraid: "She looked at me and she had this great twinkle in her eye and she said, 'What do I have to be afraid of? I was 79 years old.'" "I felt clean for the first time in my life." Pilgrims spend their savings to take the long, sometimes dangerous journey to Mecca, the spiritual center of Islam. Tagliacozzo was interested in the spiritual effects of Hajj and asked subjects if they would make the trip again. Most people said that they want to go again -- one Brunei man explained that because of the Hajj he felt "calmer in his heart." Some say they would like to perform the Hajj for someone else, an elderly or disabled relative or even someone who has passed away. A Filipina Muslim said, "You can be very poor and still go on the Hajj several times." Many wealthy Filipinos, she said, never go on Hajj. Many women said that the Prophet's mosque in Madinah had particular spiritual power. Women there would hold hands and form a circle around a sister so she could get down on her knees and pray without being jostled by the crowd. Others felt strongly about following the paths of Muhammad's life over the plains of Arafat. Most, however, reported overwhelming emotion from the Ka'bah itself: "I felt clean for the first time in my life," one man told Tagliacozzo. Many said they saw unexpected things in Mecca and Medina. "I was told again and again that people saw the faces of the dead in the crowds," said Tagliacozzo. The people he spoke with saw children, neighbors and grandparents who had died two to forty years earlier. Other people said they saw strange cloud formations over Mecca. One man reported a medical miracle; he said his son had an inoperable brain tumor but when he drank water from the holy well of Zamzam the tumor inexplicably shrank. "It's easy to attribute these kinds of stories to the exhaustion and stress and spiritual ecstasy that often accompany a pilgrim's sojourn to the holy cities," said Tagliacozzo, "but they crop up again and again in different forms and in different tellings by many hajjis." Most pilgrims felt closer to Islam and believed that they had become better Muslims. Tagliacozzo said that it was more complex than that, though: "One Hajjah looked at me quietly for a moment and chose her words very carefully: 'I think proximity to God comes in low and high ebbs and the Hajj does not necessarily affect that union. It's a little worse for me right now, unfortunately, though I have indeed been to the Holy cities." "At the end of this you have a really nice sense that people who are on different sides -- America and the Muslim world -- have sat down and talked about something important." "The kinds of conversations you can have are partially predicated by who you are. Being an American in today's world means certain things; it has signification rights in large parts of the Muslim world." A Chinese or Japanese researcher, Tagliacozzo says, will have a different experience because they are seen as neutral. Being a young American male traveling in Southeast Asia was a challenge at times. "The only thing you can do is be honest," Tagliacozzo says. People were sometimes nervous that he is an American, but "most people," he says, "if they feel you're genuine -- and not using material to give to the CIA -- responded well." Some people nonetheless did not trust him and clammed up, however, no one refused to speak to him, despite their questions about what he was doing there. Tagliacozzo assured them that he is an historian and not working for the government. He steered away from talking about violence, al-Qaida or terrorism, especially in southern Thailand and the Philippines, where there has been violence against Muslims recently. He stayed on the topic of the Hajj. "At the end of this you have a really nice sense that people who are on different sides -- America and the Muslim world -- have sat down and talked about something important," says Tagliacozzo. His new book will be about movement, travel and why people spend so much time and effort to go on Hajj even though it is often dangerous and debilitating to do so. "I think it's really fascinating and wonderful that people are willing do something like that," Tagliacozzo says. Tagliacozzo received his PhD at Yale University. 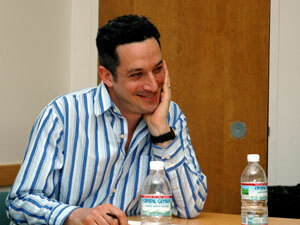 His book, Secret Trades, Porous Borders, will be published in July by Yale University Press. He expects to finish his book about Southeast Asian Hajj in several years.